The ancient Maya were avid sky watchers, after millennia of observations of the heavens they gained an uncanny knowledge of time and the harmonious composition of the cosmos. Their comprehension of the qualities of the universe, the mysterious movements of astral bodies and the principals of time evolved into their quadripartite philosophy of the cosmos; a belief system that inspired the scientific culture that guided the Maya civilization. It has been long been an enigma how the Maya achieved such elevated scientific and technical levels in the total isolation of a tropical rainforest. Why were the Maya so different from other ancient civilizations? They appear to be out of time and space. The Maya developed their corpus of scientific and technical knowledge in total isolation without the aid of outside cultures. The Maya optimized their native ingenium to become America?s first scientists and engineers. One of their great advantages was time. Not only did the Maya venerate time, but time was on their side. The 3000 year term of the civilization enabled Maya scientists, engineers, and technicians to develop an idea or concept, assess the results, perfect their work and utilize the scientific method, to finally get it right. . Their scientific civilization was the result of their own cognitive thought process; it did not result from outside influences or assistance from extraterrestrials, but was a result of the genius of native intelligence. They were far distant from other cradles of civilization; they developed their own sciences independently. Their captivation with time and the movement of cosmic bodies were the stimuli for the development of their accurate astronomy, elegant mathematics and a written language developed to record their calculations and ideas. Maya technicians had the intellectual capacity to solve abstract problems in technology with this knowledge they built cities with structures towering above the rainforest, reservoirs for storage of potable water, paved roads tracking through the jungle. They built the longest bridge in the ancient world, overcame the lack of metal tools, and beasts of burden. They built and launched sea going cargo vessels that extended their lucrative trade routes for thousands of kilometers over the shining seas. The Maya sciences included achievements in astronomy, mathematics, calendrics and a concise written language. Their scientific and technological achievements were more advanced than any other contemporary culture on the planet. Their mathematics and astronomy enabled them to calculate the true meaning of December 21, 2012. They have been compared to the Egyptians for their use of hieroglyphic characters in their writing, to the Greeks for their development of advanced sciences, to the Romans for construction paved highways and to the Phoenicians for long?range trading in seagoing vessels. Archaeologists have studied the abandoned cities and the carved art that was inscribed into the facades of the Classic Period buildings. These inscriptions have provided abundant evidence of the historic accomplishments of this brilliant culture. Moreover, accomplishments of the Maya have been revealed through translations of their surviving books, carved inscriptions and other written documentation. Their achievements continue to astonish the academic world. However, scholarly research devoted to the Maya, has completely overlooked the technological achievements of Maya engineers. These technological achievements enabled the survival, good health, and favorable lifestyles of the inhabitants who populated the world's densest urban centers. Technology enabled the survival and growth of the Maya society in spite of their precocious tropical environment. They suffered from an inconstant supply of rainwater, poor soil conditions, and a lack of surface water. Maya engineers successfully developed efficient water management systems and technologically advanced agriculture systems that overcame the shortfalls of their environment and enabled the prosperity of the society. However, the Maya had an artificially high population, which was the result of their advanced technology. Then disaster struck the Yucatan Peninsula. A drought, the worst in 3500 years, devastated the Maya. The same advanced technology which built the amazing cities and enabled their large populations could not save the Maya. Catastrophe occurred and the scientific civilization was no more. The ruins of the grand cities lay beneath the verdant shroud of jungle growth for over 1000 years. The remains of the lost civilization lay untouched for a millennium; they were never reoccupied and are intact and frozen in time. The remains are intact for study. The author, a forensic engineer, has spent 40 years exploring more than fifty remote sites of the ancient Maya. Using forensic engineering techniques, remote sensing and digital tools, he has uncovered and digitally reconstructed lost engineering achievements and technology of the Maya. The technology of the Maya was a brilliant extrapolation of their scientific cosmology. The author reveals a series of surprising discoveries of Maya technologies that were thousands of years in advance of similar European inventions.. He applied his engineering skills to identify the tantalizing clues that lay hidden in plain sight, and has assembled them into an intriguing mosaic for inclusion in the book. He has revealed the technological secrets that enabled this great scientific civilization to live in a challenging natural environment. This book will detail how the Maya developed specialized tools harder than steel; fabricated cement to build innovative cast?in?place structural systems for high?rise buildings in their great cities; water management systems that enabled a dependable water supply for potable and agriculture usage; paved highways; a bridge system that enabled the longest bridge in the world and a human transport system that was more efficient than animal power. 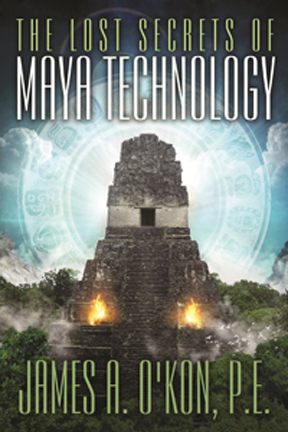 To order The Lost Secrets of Mayan Technology from Amazon.com, click here!